Each child is special and we believe that a happy, confident child will achieve their full potential in all areas of development. Making Miracles Nurseries offer and support stimulating child-led environments. To provide for the diversity and challenging needs of each child enabling them to participate in all activities that seek to increase their intellectual, creative, social, physical and emotional development. To ensure all children encounter equal opportunities, respect and anti-discrimination in the setting. Making Miracles Nurseries work in partnership with parents/carers for the good of the child. We operate an ‘open policy’ which encourages parents to drop in at any time and participate in all aspects of nursery life. Our open plan rooms allow for children, of all ages to join together every day for music, stories songs and also at meals times. Making Miracles Nurseries aims to provide a wide range of activities with a balanced approach to the early year's curriculum guidance. All activities are child led and initiated from their own personal interests. 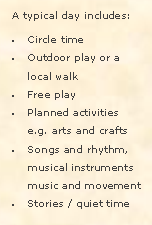 All planning is age appropriate and we ensure that we include relevant multicultural activities and celebrations. Making Miracles uses Tapestry - an online journal recording all the learning and fun of children's early years education.